Does the idea of a free photo session for your baby interest you? Or… maybe you don’t have a baby but would love win a session for someone close to you? Yeah? Well!! I am prepared to give one away and YES – it can be used as a voucher for your friend or family! How about a little contest? Your entry is only valid if you follow all of the rules. Please make sure you are commenting/liking the original post. Free photo session includes up to 1 h session, 10 high resolution digital images and print release. The session is designed for babies from 3 months up to 12 months old. 1. This competition is run by Wojciech Koza Photography and is in no way sponsored, endorsed or administered by, or associated with Facebook. 3. Closing date for entry is 25th November at 6pm. 4. 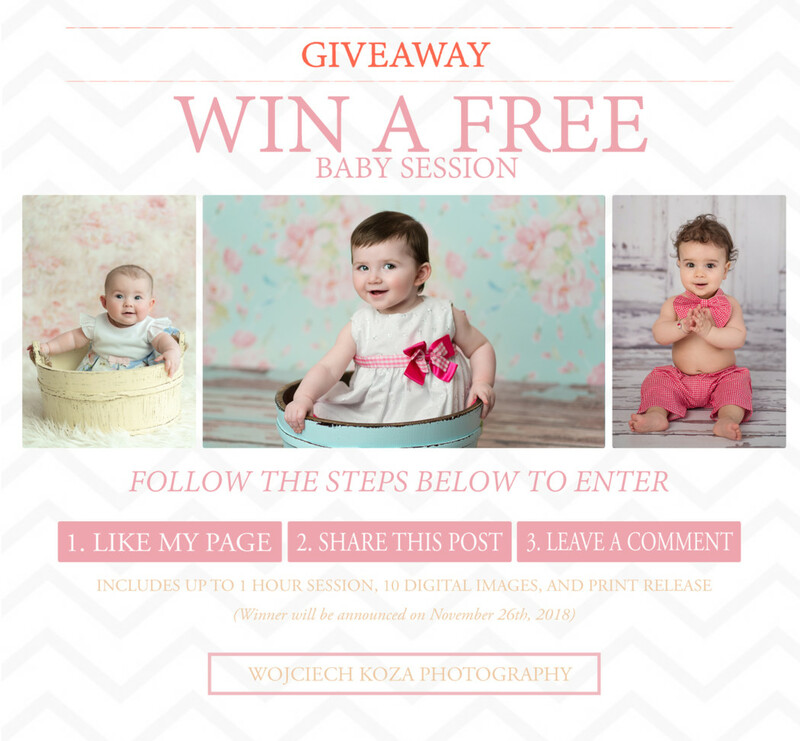 The prize is up to 1 h baby photo session, 10 digital, high resolution images with print release. 5. No cash alternative to the prize will be offered. The prize can be tranferable to friend or family for their baby. 6. Winner will be chosen at random. 8. The winner agrees to the use of his/her name and images in any publicity material. 9. The promoter reserves the right to cancel or amend the competition and these terms and conditions without notice. 10. By entering this competition, an entrant is indicating his/her agreement to be bound by these terms and conditions. 11. Session can be used for baby milestone sessions only (excluding) newborn session. This means that the session is dedicated for babies from 3 months to 12 months old. 12. Photography contract is to be signed before I even schedule your session. Each winner will be randomly chosen on the 26th of the month. Winner will have 3 months to schedule and complete the session. That’s it, pretty easy, huh? This gallery presents photos that are generally about pink, text, product, child, toddler, infant, cheek, textile, design, font	in .